The week saw two wipe-outs: Trump dominated in the Nevada caucuses, getting 46% of the vote and destroying the idea that his support had a ceiling well below that. And Clinton had an even more impressive victory in South Carolina, defeating Bernie Sanders nearly 3-to-1, 74%-26%. Tomorrow is the first multi-primary day. Both parties have contests in Arkansas, Georgia, Massachusetts, Oklahoma, Tennessee, Texas, Vermont, and Virginia, while Alabama has only a Republican primary. Republicans. Until Tuesday, the conventional wisdom among Republicans was that the other candidates were vying to get into a one-on-one runoff with Trump, where the non-Trump candidate would surely win. And so here in New Hampshire, I saw countless anti-Rubio and anti-Cruz ads — and even anti-Christie and anti-Kasich ones — but virtually no attack ads against Donald Trump. Trump himself advertised very little, but held big rallies and did his usual impressive job of drawing free media attention. The others tore each other apart and Trump won. Since Tuesday, Rubio in particular has been going after Trump, sometimes with some very personal ridicule, but Trump looks set to sweep the Super Tuesday states tomorrow anyway, with the possible exception of Cruz’ home state of Texas. If that holds, I have a hard time seeing how Trump loses the nomination. Not just because his position is so commanding, but because I don’t know what scenario I’m counting on if I bet against him. Is Rubio suddenly going to become the dynamic candidate of Republican establishment fantasies, rather than the lightweight he otherwise seems to be? And as I explain in this week’s featured post, the best arguments against Trump are off-limits to Republicans. Democrats. After Sanders’ big victory in New Hampshire, pundits talked about Clinton’s minority “firewall”: Hispanics in Nevada and blacks in South Carolina. Sanders supporters countered that while their candidate may have been slow to catch on among non-white Democrats, now that he was seen as a viable threat to Clinton the polls would change. Nevada was inconclusive for that thesis: The caucus entrance polls said Sanders won the Hispanic vote, but by a margin well within the margin of error. Nonetheless, Nevada’s black vote came in overwhelmingly for Clinton and put her over the top. But in South Carolina the firewall held, by a margin even larger than the Clinton people expected. Blacks increased their share of the primary electorate from 55% in 2008 to 61% in 2016, and Clinton got even more of their support than Barack Obama did: 84% rather than 78%. It’s official: Bernie Sanders has a black problem. You can argue that the problem arises through no fault of his own — he has a good civil rights record and hasn’t been race-baiting — but it’s there. People ask me why this is, to which my first answer is: “I’m a white guy, what do I know?” If pressed, my second answer is that the slow, stuttering, back-and-forth progress of racial justice in America makes Bernie’s promise of “political revolution” sound like pie-in-the-sky to many blacks, while Clinton’s message (that progress is hard, and that we have to be as focused on defending what Obama has accomplished as we are on going further) seems more realistic. But if that doesn’t sound right to you, I’ll retreat to my first answer. As for what to expect tomorrow, Nate Silver’s primary-prediction model gives Clinton a better-than-98% chance of winning Arkansas, Georgia, Tennessee, Texas, and Virginia. The model gives her an 88% chance in Massachusetts and 75% in Oklahoma. It predicts a Sanders victory only in his home state of Vermont (99%). Obviously, if that happens Clinton will have a huge lead in delegates come Wednesday morning. Does that mean the race will be over for all practical purposes? Not necessarily. An interesting tool for analyzing the race is Nate’s list of state-by-state benchmarks. The methodology here is interesting: He’s projecting who would win each state by how much if the race were a 50-50 tie nationally. Nate’s list shows that tomorrow’s primary states are ones you would mostly expect to be good for Clinton, though she seems to be polling above his benchmarks. A better run of states for Sanders happens after March 15. Nonetheless, another 538 analyst, Harry Enten, sees South Carolina as a major setback for Sanders: Until then, he had been gaining on the benchmark totals he needed to pull even, but in South Carolina he lost by nearly 50% rather than the 20% loss the benchmark predicted. Tomorrow night, the state I’m going to be watching is Virginia, which should be a swing state in the fall. Nate’s benchmark is for Clinton to win by 9%. If the margin is less than that, Bernie might still make a comeback. BTW, I’ll repeat a point I first mentioned a few months ago: The way you beat a bully is by making people laugh at him, and the Democrats have a great comedian in Senator Al Franken. Wouldn’t he be the perfect VP candidate if the Republicans nominate Trump? In something of a shocker, news leaked out of the White House the Republican Governor Brian Sandoval of Nevada was being vetted for the Supreme Court. Sandoval favors business over labor, but also seems pro-environment and is said to have “moderate” views on abortion, whatever that means. In short, he’s exactly the kind of compromise you might expect Republicans to leap on, if they were at all inclined to do that kind of thing. Apparently they aren’t. Floating Sandoval’s name didn’t move the needle at all, and the governor removed himself from consideration a few days later. If Obama’s plan was to appoint Sandoval, Democrats might want to take their chances on winning the next election instead. But if he was just trying to show America how unreasonable the Republican position is, he succeeded. Just before the South Carolina primary, a pro-confederate-flag protest turned into a spontaneous Trump rally. A reporter for the Young Turks interviewed participants, who warned of “ethnic cleansing” against whites and expected Trump to do something about it. In Iowa, fans at a white high school began chanting “Trump! Trump! Trump!” after losing a basketball game to a team with more non-white players. It’s hard to say exactly what they meant by it, but apparently his name either invokes white pride or is supposed to intimidate non-whites. One way to research this question is through polls. For example, Public Policy Polling found that 38% of Trump supporters in South Carolina wish the South had won the Civil War, and various other polls have turned up additional disturbing results. But again, these results may be anecdotal, or may be blaming Trump for bad attitudes that could be found among many candidates’ supporters. I resisted for a long time the notion, because again it is kind of a default for people on the Left, that “Oh, this is all about race.” But, like, I have almost come full circle the other direction, to where I think the media is not talking about this enough. And I think the centrist Joe-Scarborough pundits who are like “Oh, Trump will really shake things up” [have] to acknowledge the fact that some of this support is a result — maybe not a majority, I think probably just a plurality — but some of the support is a result of … of some of the worst impulses that Americans can have. And to indulge that, I think, is something people should be thinking about more carefully. a poll from AP-GfK, based on interviews between February 11 and 15. Most of the poll consists of typical questions: whether the country is on the right or wrong track, how well President Obama is doing his job, how important various issues are, and so on. 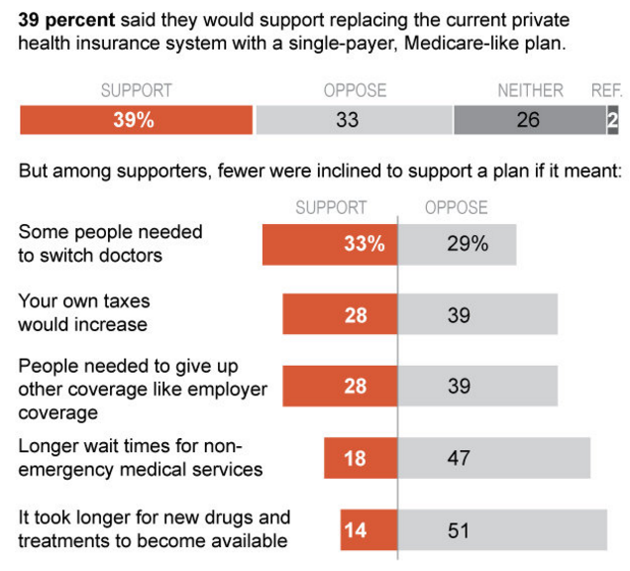 Would you favor or oppose replacing the current private health insurance system in the United States with a single government-run and taxpayer-funded plan like Medicare for all Americans that would cover medical, dental, vision, and long-term care services? A plurality favors the program, 39%-33%, which sounds good for ambitious liberals. But then they start filling in details, and approval drops. What I think we’re seeing here is the low-engagement voter problem that I discussed a few weeks ago in “Say — you want a revolution?” Large numbers of voters have not thought through the issues well enough to have a coherent position. So if you ask them the wrong question and take their answer too seriously, you can easily get misled. Republicans run into this problem when they ask people about government spending. Polls show that by a wide margin people believe the government spends too much. But when you get specific about what to cut, you find that the public also supports just about everything the government spends money on. What do they want less of? Bridges to nowhere, welfare for able-bodied adults who refuse to work, foreign aid to countries that hate us, and subsidized art projects that offend them — all of which adds up to way less than 1% of the budget. The other 99-point-something percent they’re fine with. That’s why Republicans have learned not to specify their cuts, but to run on across-the-board reductions that make somebody else pick the victims. As Ben Carson put it: “Now anybody who tells me there’s not 3 to 4 percent fat in virtually everything that we do is fibbing to themselves.” Does that mean he wants to cut your Mom’s Social Security or your uncle’s veteran benefits by 3-4%? No, of course not! How can you think such a thing? The contradiction that gets Democrats in trouble is that people love progress, but they hate change. Maybe there’s a great plan to improve public schools — and God knows that schools in general need improvement — but if your kid likes his teacher and has some friends in his class, you’re going to look at that plan skeptically. And I know that American health care is way too expensive and doesn’t cover everybody, but personally I understand how my insurance plan works and I like my doctor, so do I really want to shake things up? Tell people that you’re going to improve things, and they’ll love it. Tell them that their own lives are going to have to change in incompletely specified ways that are probably going to be more positive than negative, and they’ll doubt you. That’s how the insurance companies beat HillaryCare in 1993. That’s why ObamaCare’s worst press was about people whose insurance plans got cancelled. Almost invariably, the people in those stories eventually got a better deal, but that didn’t matter. They were forced to change, and change is scary. In 2017, Medicare-for-All will have exactly the same problem. Will masses of people take to the streets to demand Congress pass it? Will filibustering senators fear the wrath of the American people in the 2018 elections? I’m skeptical. I also think it’s interesting to speculate on what the same question might mean to different respondents. For example, on page 14 of the AP-GfK poll you find: “Which party do you trust to do a better job of handling the U.S. image abroad?” The numbers are close: 27% trust the Democrats more; 26% the Republicans, which is not a statistically significant difference. But I suspect those two groups of people aren’t really answering the same question at all. If you’re a Democrat, probably the “image abroad” you worry about is that we’re crazy assholes: We start wars for little-to-no reason; we torture people; we want veto power over other countries’ revolutions; we think the rules that apply to every other nation in the world shouldn’t apply to us. So you want Democrats in office to make us behave like good citizens of the world. But if you’re Republican, probably the image you worry about is that we’re pushovers; you want Republicans in office to convince foreigners not to mess with us. If we have to drop bombs and waterboard people to get that point across, so be it. Andrew Hacker in the NYT magazine imagines teaching statistics for understanding the real world. Thanks for the correction. Now I’m trying to figure out how that got into my head. Perhaps because 538 has no projections for the Alabama democratic primaries? The problem with the pool about universal health care is that none of the specifics they list are true. Why would anyone need to switch doctors under single payer (unless they were seeing a naturopath or some other fake doctor)? Your taxes might increase, but your health insurance premiums would vanish, a net gain, except, hopefully, for the wealthy. People would not need to give up employer-based coverage–it would just vanish. Hospitals could get more money, and hence have faster service, and still lower costs overall with the money paid to private coroprations taken out of the equation. Drug companies are far from ideal drug developers–I suppose the objection envisions that if drug prices were kept reasonable, pharmaceutical companies might not want to invest in new drugs. Fine. Government does science better than private industry. Alabama has a Democratic Primary. We vote for our choice for President. Few others run, but we are at least not disenfranchised there. Sorry about the mistake. Something I saw led me to assume the two parties were doing their primaries on different days, as in South Carolina. If it makes you feel any better, I AM a black woman who lived most of my life in North Carolina. And I can’t figure out why Hillary was such a hit with black South Carolinians. I know this quote was sometimes referenced during the failure of healthcare reform during the Clinton years. I quote Machiavelli not to say that we shouldn’t dare greatly, but that we need to strategize carefully to anticipate and prepare for this very real phenomenon. Just as you say, we can’t afford to be naive about it. I hadn’t seen that quote before, but it is very on point. Thanks. Also very relevant for campaign finance reform. Maybe Franken should be on the campaign trail, even if he isn’t a candidate.